New and improved Moriarti Arms ® Billet Complete Classic MA-10 .308 Lower Receiver is fully assembled and ready to complete the look of your AR-10 .308 Rifle. Our lowers are DPMS compatible and use standard .308 magazines. 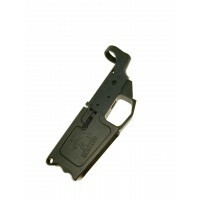 Lower Receivers are an FFL item and must be shipped to an FFL. It must be purchased separately from any other items. Please enter your information or the receiving party's (the person that will be picking it up) information under "Recipient Name" while checking out. To expedite your order, please have your dealer email their FFL to us. If the dealer you are using to transfer a firearm has not sent us a currently updated FFL to put on file, there will be an extended period of time needed to process your order. THIS ITEM MUST SHIP TO A FFL. MUST BE 21 TO PURCHASE. PLEASE HAVE YOUR FFL EMAIL A SIGNED COPY TO US AT INFO@MORIARTIARMAMENTS.COM. YOUR ORDER WILL NOT BE PROCESSED UNTIL WE HAVE THE COPY. 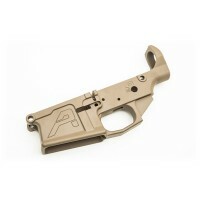 PLEASE BE SURE THE FFL REFERENCES YOUR INVOICE NUMBER IN THE EMAIL, OR YOUR ORDER CANNOT BE PROCESSE..
Aero Precision M5 (.308) Complete Lower Receiver, Standard - Anodized Black. 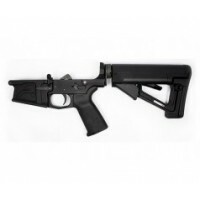 M5 .308 Complete Lower Receiver is the perfect base for your custom big-bore AR rifle. 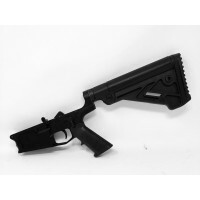 Features:Works with standard DPMS 308 components and magazinesRear takedown pin detent hole is threaded for a 4-40 set screwBo..
Aero Precision M5 (.308) Complete Pistol Lower Receiver Standard - Anodized Black. Features:Works with standard DPMS 308 components and magazinesRear takedown pin detent hole is threaded for a 4-40 set screwBolt catch is threaded for a screw pin (no roll pin needed)Integrated trigger guard..
Aero Precision M5 (.308) Enhanced Complete Lower Receiver w/ Magpul MOE & STR - Anodized Black. 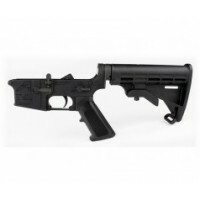 M5 .308 Complete Lower Receiver is the perfect base for your custom big-bore AR rifle. 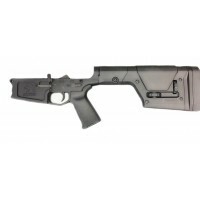 This enhanced complete lower receiver includes the Magpul MOE Grip and STR Stock. 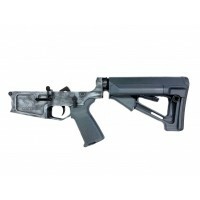 Features:Works with s..
AR 10 .308 REDX STRIPPED BILLET LOWER RECEIVER. THIS IS AN FFL ITEM. THIS ITEM MUST BE ORDERED BY ITSELF WITH NO OTHER PARTS COMBINED. ANY ORDER CONTAINING A LOWER/LOWER HALF TOGETHER WITH OTHER PARTS WILL BE CANCELLED. THIS ITEM MUST SHIP TO A FFL. MUST BE 21 TO PURCHASE. 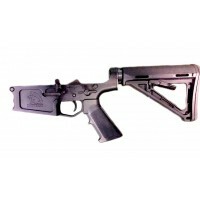 PLEASE HAVE YOUR FFL ..
M5 .308 Stripped Lower Receiver helps you build a big-bore AR from the ground up. Mil-spec dimensions and coating ensure the highest quality and correct component interface.Features:Works with standard DPMS 308 components and magazinesUpper Tension Screw - Allows users to fine tune the fit of the up..
AR-10 MA-308 MORIARTI ARMS BILLET STRIPPED LOWER RECEIVER ANODIZED BLACK. THIS IS AN FFL ITEM AND MUST SHIP TO A FFL. PLEASE HAVE YOUR FFL EMAIL A SIGNED COPY TO US AT INFO@MORIARTIARMAMENTS.COM. YOUR ORDER WILL NOT BE PROCESSED UNTIL WE HAVE THE COPY. 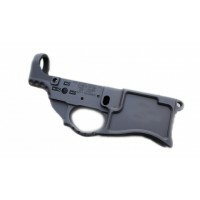 PLEASE BE SURE THE FFL REFERENCES YO..
MA-10 .308 A2 Rifle Complete Lower Receiver - Anodized Black THIS ITEM MUST SHIP TO A FFL. MUST BE 21 TO PURCHASE. PLEASE HAVE YOUR FFL EMAIL A SIGNED COPY TO US AT INFO@MORIARTIARMAMENTS.COM. YOUR ORDER WILL NOT BE PROCESSED UNTIL WE HAVE THE COPY. 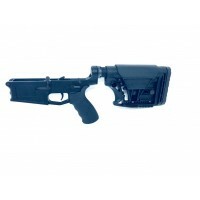 PLEASE BE SURE THE FFL REFERENCES ..
MA-10 .308 Magpul PRS Rifle Complete Lower Receiver - Anodized Black. Current ETA - 10 days from time of order.THIS ITEM MUST SHIP TO A FFL. MUST BE 21 TO PURCHASE. PLEASE HAVE YOUR FFL EMAIL A SIGNED COPY TO US AT INFO@MORIARTIARMAMENTS.COM. YOUR ORDER WILL NOT BE PROCESSED UNTIL WE HAVE..
MA-10 .308 MBA-3 Complete Lower Receiver - Anodized BlackTHIS ITEM MUST SHIP TO A FFL. MUST BE 21 TO PURCHASE. PLEASE HAVE YOUR FFL EMAIL A SIGNED COPY TO US AT INFO@MORIARTIARMAMENTS.COM. YOUR ORDER WILL NOT BE PROCESSED UNTIL WE HAVE THE COPY. PLEASE BE SURE THE FFL REFERENCES YOUR INVO..
MA-10 .308 MORIARTI ARMAMENTS STANDARD LOWER RECEIVER - ANODIZED BLACK - ANODIZED BLACK. THIS ITEM MUST SHIP TO A FFL. MUST BE 21 TO PURCHASE. PLEASE HAVE YOUR FFL EMAIL A SIGNED COPY TO US AT INFO@MORIARTIARMAMENTS.COM. YOUR ORDER WILL NOT BE PROCESSED UNTIL WE HAVE THE COPY. 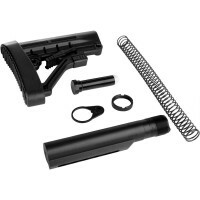 P..
MA-10 .308 MORIARTI ARMAMENTS COMPLETE MAGPUL MOE LOWER RECEIVER - ANODIZED BLACK. THIS ITEM MUST SHIP TO A FFL. MUST BE 21 TO PURCHASE. PLEASE HAVE YOUR FFL EMAIL A SIGNED COPY TO US AT INFO@MORIARTIARMAMENTS.COM. YOUR ORDER WILL NOT BE PROCESSED UNTIL WE HAVE THE COPY. 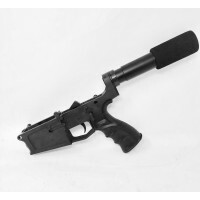 PLEASE BE SU..
Moriarti Armaments MA-308 Enhanced Complete Lower Receiver w/ Magpul MOE & STR in Black anodize. 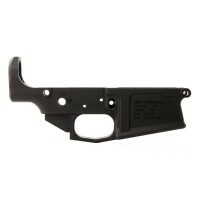 3088 Complete Lower Receiver is the perfect base for your custom big-bore AR rifle. 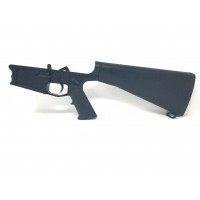 This enhanced complete lower receiver includes Magpul MOE Grip and STR Stock in Black. DPMS low profile.Features:Wo..
Moriarti Arms AR-10 .308 Complete Billet Pistol Lower ReceiverFeatures:MANUFACTURER: MORIARTI ARMAMENTSPRECISION CNC MACHINED FROM SOLID BILLET 6000 SERIES ALUMINUMBLACK HARDCOAT ANODIZEDBUILT IN TRIGGER GUARDBUILT IN WEDGE ADJUSTMENT SCREW (SET SCREW TO TAKE OUT SLOP BETWEEN UPPER AND LOWER)P..